We seek a noninvasive, functional, radiological imaging method to determine the specificity and sensitivity of an ablative treatment for deeply placed lesions that cannot be directly visualized, in our case phthalocyanine-4 photodynamic therapy (Pc 4-PDT) of brain tumors. In a preliminary study we had expected that micro-positron emission tomography (μPET) would show dramatically reduced if not negligible 18F-FDG activity following Pc 4-PDT; however, our study has not found a statistically significant difference between the imaging of brain tumors in animals that underwent Pc 4-PDT and those that did not. While several magnetic resonance imaging (MRI) pulse sequences also did not discriminate tumors that had received treatment, our study of dynamic contrast enhancement magnetic resonance imaging (DCE-MRI) was able to discriminate tumors that had undergone necrosis following Pc 4-PDT. 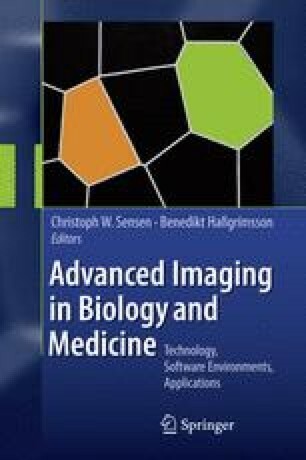 We expect that in addition to imaging therapeutic necrosis, it will also be possible to utilize other noninvasive, radiological imaging techniques to track apoptosis and/or autophagy in deeply placed lesions following treatments such as Pc 4-PDT.